Solid Ground’s print newsletter highlights lots of great partnership and program activities. Sign up here to receive the entire newsletter by snail mail! Not your average real estate agents, The CoHo Team of Windermere Agents has a unique vision: They believe that home – a place of shelter, a vibrant neighborhood and community, a sense of safety and belonging – should be obtainable by all. To help make this a reality in our community, they contribute both significant funds and hands-on service hours to nonprofits like Solid Ground that are involved in housing and community development. Thank you, CoHo Team, for your committed partnership! For more info on partnering with Solid Ground, please contact us at 206.694.6803 or development@solid-ground.org. For families living on low incomes that include an adult living with disabilities, affordable housing can be nearly impossible to find, let alone keep. Many families on fixed incomes essentially live from crisis to crisis. King County’s homeless services system identified the need to create more capacity to provide long-term housing for families with disabilities who are experiencing homelessness. Solid Ground’s Sand Point Family Housing is among the initial group of five area transitional housing providers to convert to permanent supportive family housing. Changes coming to the program include round-the-clock staffing to help residents overcome a more complex set of challenges, and support for families in long-term stable housing. Increasing partnerships will bring more support services onto campus. Case workers and housing advocates are working with current tenants – all of whose leases will expire before the program conversion – to secure long-term housing. But because of the changing program model, few if any will be eligible to remain at Sand Point Family Housing. Our Cooking Matters nutrition educators completed 13 class series in the third quarter! The classes, which focus on preparing healthy, culturally appropriate meals on a budget, were hosted by a variety of community organizations – including five at Low Income Housing Institute (LIHI) locations and two in Toppenish, WA through our satellite partner, the Quinault Indian Nation. Our own Seattle Community Farm recently cohosted a six-week series for teens affiliated with the Refugee Women’s Alliance (ReWA). Other new satellite partners include Verdant Wellness Center in Lynnwood, which hosted their first Spanish Cooking Matters class in October, and Hopelink, a fellow King County Community Action Agency, which will host classes at their five Eastside locations starting in early 2016. Our Financial Fitness Boot Camp was selected by The Financial Clinic of New York City to partner on the launch of a new financial skills coaching platform, recognizing Solid Ground’s leadership in financial empowerment education and services. Thanks to Premera Blue Cross for sponsoring Your Passport to the World of Volunteering, featuring our RSVP (Retired & Senior Volunteer Program) and 23 of their site partners promoting King County volunteer opportunities. The Master Builders Association selected Sand Point Family Housing for their Painting a Better Tomorrow project. As we go to press, 150 Master Builders volunteers are painting the rooms and common areas of these two historic naval buildings to freshen up the apartments. Sometimes, food justice starts with access to seeds to grow your own food. Lettuce Link offers a tip of the Swiss chard hat to seed donors Burpee, Good Seed Company, Molbak’s Garden + Home, Neighbor Sally’s Nursery, Park Seed, PCC Natural Markets (Headquarters & U District), Seattle Seed Company and Sky Nursery. 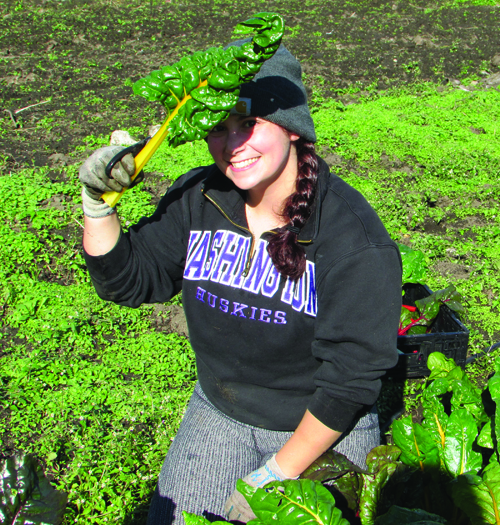 And a muddy salute to all of the organizations who brought volunteers to Lettuce Link’s Seattle Community Farm and Marra Farm Giving Garden. Your hard work helped people who need it get healthy, nutritious food: Cascadia Montessori, CDK Digital Marketing, Community Court, Concord International School Teachers, Ethan Stowell Restaurants, Expedia, Friends of Youth, International Community School, Overlake School, Pepperdine University Alum, Plymouth Healing Communities, Seattle Works, Starbucks, The World Is Fun, T-Mobile and United Way. What will your legacy be? Find out how you can continue to fight for social justice long after you’re gone. For information on how to include Solid Ground in your will or estate plans, please contact Leah Lee at leahl@solid-ground.org or 206.694.6852. For Volunteer Opportunities at Solid Ground, contact volunteers@solid-ground.org or 206.694.6825. All who come to Solid Ground for housing, food and other services face challenges to meeting these basic needs – but there’s an added layer of complexity for our program participants who speak little or no English. To ensure that our services are available to all who need them – regardless of their primary language – we prioritize access to interpretation and translation services. Solid Ground program participants come from myriad cultural backgrounds and language traditions (including American Sign Language). To meet their unique needs, our staff access interpretation and translation services approximately 800 times a year for about 25 different languages. Our Language Access policies are grounded in our racial and social justice work, as they are absolutely essential to our ability to meet people’s needs in an equitable manner. Connecting staff to language services gives them the tools they need to more competently work with limited-English speakers. We strive to leverage both internal and external resources to help staff do their jobs well. For nearly a decade, a staff Language Access Team – comprised of multilingual staff as well as those who frequently use language services on the job – has worked together to create policies, procedures and a resource guide to inform our work and continuously improve how we deliver services. The team developed staff training in best practices when working with limited-English speakers, and tips for effectively working with interpreters. Our Language Access policies support staff in making sure program participants have equitable opportunity to understand the services available to them. They also value the internal capacity of our bilingual employees to interpret and/or translate English into other languages. Solid Ground also maintains multiple bilingual staff positions to meet significant language needs in different program areas. Bilingual staff are given extra compensation for their skills. In short, language access is key to Solid Ground’s mission, and we are committed to continually improving our services for limited-English speakers. Big Picture News is a segment of Solid Ground’s Fall 2015 print newsletter. Sign up here to receive the entire newsletter by snail mail! 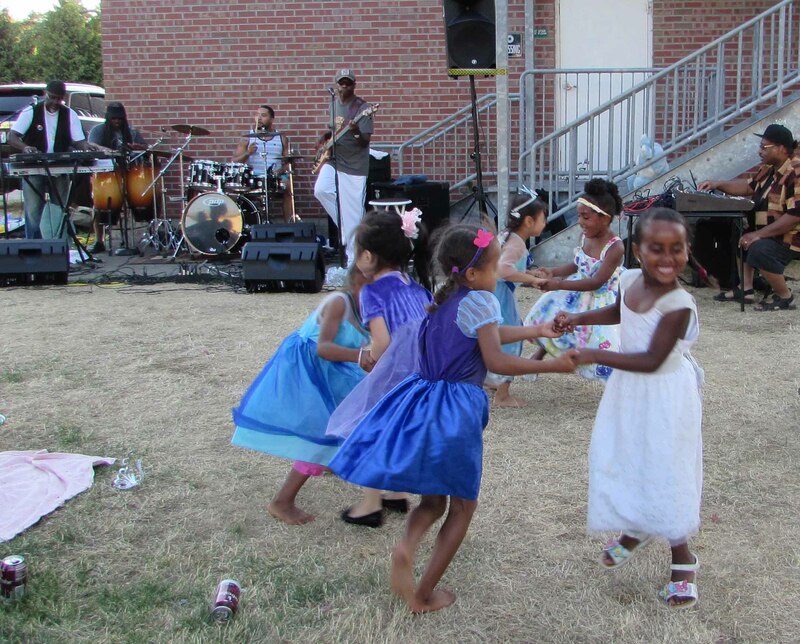 What do you get when you combine the following ingredients: a balmy summer evening, live music, about 25 kids dancing as if no one was watching, watermelon, cupcakes and a talent show? A delicious recipe for BIG fun! Residents and staff of Solid Ground’s Sand Point Housing (SPH) campus came together last week for a unique event: the first performance of the jazz fusion band 800 Watts of Bass – fronted by bassist and SPH resident Luke Jackson – followed by a talent show for anyone brave enough to step up and share. Let it be known: SPH residents stepped UP! 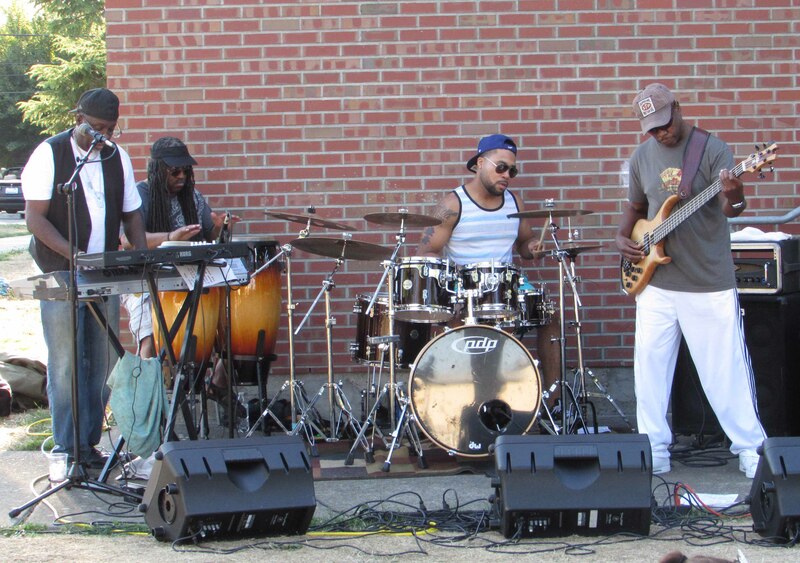 When the band first started, the mood was pretty mellow. A handful of families and teens trickled in. Little girls in princess outfits (later dubbed the “Let It Go” girls) giggled and huddled together on a blanket. Moms and siblings with babies in strollers found spots on the lawn. But as soon as the band started grooving, the Let It Go girls did just that, leaping into joyful dancing which hardly stopped all evening. Luke says his mom got him into music as a kid, and it kept him out of trouble and gave him a positive community to be part of. He’s played in various bands over the years but had to stop performing about three years ago when his kidneys began to fail. He’s still in dialysis three times a week and on a transplant waiting list, but thanks to regular exercise, his energy has returned enough to allow him to pick up his passion again and start gigging. His current goal is to complete an album by 2016. Luke says, “I loved seeing the kids come out; it was basically for the kids. Music doesn’t have an age on it.” With a beaming smile, Jasmine Johnson danced with her two girls, Kenya and Niylah – and then with any other kids who got drawn into her circle of energy. The band played for about an hour, and then the true joy exploded when about 10 resident kids and youth – and a few adults – put their talents out into the world. From drumming to poetry readings to solo and group songs (cue the Let It Go girls) to dancing to gymnastics to lip syncing, the night was filled with laughter and support and parental pride. There was real budding talent on display. Niylah owned the mic as she belted out The Greatest Love of All. Kids who initially hesitated to start their acts were bolstered by supportive cheers from the crowd and soon dropped any sign of nervousness. Even some adults got into the act: Resident Joy Sparks moved seamlessly from cuddling her infant to rocking out, surrounded by a cheering crowd of devoted young dancers. For me, trying to be a fly on the wall and soak it all in, I was in awe of the community Sand Point Housing residents have created for themselves. And when the program officially ended, the fun didn’t stop: Jasmine says, “We danced and danced, and then when the talent show ended, we danced some more.” It was a magical, joy-filled night we’ll remember for a long time. Below is the Big Picture News insert from our Summer 2015 Groundviews newsletter. To read the entire newsletter or past issues, please visit our Groundviews webpage. I’m sure you’ve heard it a million times: “We couldn’t do it without your support!” But when it comes to Solid Ground volunteers, this nonprofit fundraising mantra is much more than a platitude – it’s a reality. By the Independent Sector’s standard, one volunteer hour in Washington state equals $27.54. In 2014, this translated to nearly $6.8 million in volunteer labor – more than one quarter of Solid Ground’s annual budget! We very literally could not accomplish our work without them. Volunteering is win-win, changing lives for the better both for our program participants and our volunteers. Volunteers share their talents, learn new skills, and make connections while taking action to improve our community and help our neighbors in need. They play a meaningful role in something big. Hands-on projects: Grow fresh, organic food for local food banks, or help renovate residential building spaces. Direct service with people: Tutor and mentor kids coming out of homelessness, or teach children, teens, adults and families about nutrition and cooking. Community outreach: Help communities register to vote, or represent Solid Ground at informational events. Behind the scenes: Help put on events for our program participants and supporters … and more! 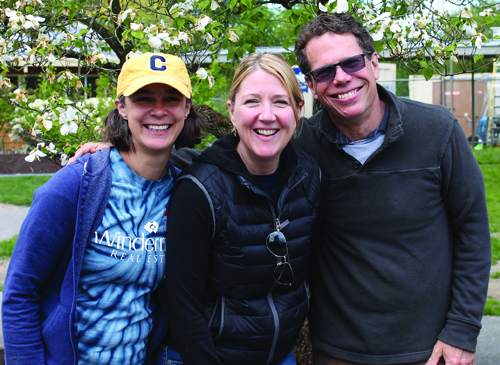 Lettuce Link is one Solid Ground program that relies heavily on volunteers to work with and in communities to grow and share fresh, nourishing food. Lettuce Link Program Manager Nate Moxley says, “Volunteers are the life force of Lettuce Link. Their work and dedication allow us to manage two education and access farms where we host hundreds of classes, field trips and community groups every year.” Additionally, volunteer giving gardeners donate the bounty of their labors, and last year grew more than 55,000 lbs of fruits and vegetables for food banks and meal programs. Senior volunteers also make an enormous contribution to the Solid Ground community. Our RSVP (Retired & Senior Volunteer Program) matches volunteers 55 and older to opportunities both with Solid Ground programs and with 52 partner organizations across King County. Thank you to all of our amazing volunteers! For more info on volunteering, visit our Volunteer webpage, or contact our Volunteer Coordinator at 206.694.6825 or volunteers@solid-ground.org. Below is the Big Picture News insert from our Spring 2015 Groundviews newsletter. To read the entire newsletter or past issues, please visit our Groundviews webpage. At Solid Ground, financial empowerment is integral to our mission to end poverty. Financial justice starts with helping people understand their personal finances, build resilience and achieve financial stability. On a policy level, we work to break down systemic barriers that keep people poor. Our Financial Fitness Boot Camp (highlighted in the lead story of this newsletter) provides an important model for this work – but it is just the jumping off point for a much larger movement. In integrating financial empowerment across the Solid Ground community, we focus on people’s strengths to provide tailored support and access to resources so that everyone – including our staff and volunteers – can realize their financial stability goals and access opportunities to thrive. Financial empowerment will help our community shift from generations of poverty to generations of financial stability. Through education, people have the power to achieve financial stability. Understanding personal finances develops individual power and furthers economic justice. People are capable and resourceful in creating pathways to financial independence; with the right tools, they can make informed decisions. Financial empowerment brings awareness of one’s own capabilities and strengths. We can help alleviate fear of banking systems through financial empowerment. We are cheerleaders for our clients’ pathways to financial independence. All Solid Ground programs can instill the importance of building and saving assets. Through financial empowerment, we can help people believe in their ability to become financially independent. Basic Budgeting & Money Management: Creating savings and spending plans, prioritizing debts/expenses, and creatively thinking outside the box about how to manage money. Understanding Credit: Developing a better understanding of the meaning of credit scores and awareness about what people can do to improve their credit. Asset Building (income creation): Celebrating assets and asset-building accomplishments, and identifying ways to build assets and income-boosting supports such as tax credits and public benefits. We discuss budgeting basics to help people maintain affordable housing. We connect people with job/training opportunities and resources. We provide nutrition and food budgeting education – focused on the affordability of healthy eating – and support people to grow their own food. And we work with banks to create opportunities for people to develop savings. On a systems level, we support income equality and raising the minimum wage. We also advocate statewide for issues such as increased debt settlement regulation and consumer protections on payday loans. Combined, these efforts are creating systemic change to build a financially healthier community and economic justice for all. This post taken from the Big Picture News insert from Solid Ground’s May 2015 Groundviews newsletter. To read the entire newsletter or past issues, please visit our Groundviews webpage. Below is the lead story of our Spring 2015 Groundviews newsletter. To read the entire newsletter online, please visit our Groundviews webpage. Jonah chose option two and has been proactive in improving his life ever since. He found shelter and got on food stamps immediately, and soon entered the FareStart job training program, which he explains “uses cooking as the mechanism to teach you employment skills, life skills.” Through FareStart, he connected with Solid Ground’s Financial Fitness Boot Camp Coach, Judy Poston, when she held a workshop there on the basics of budgeting, savings and credit repair. Judy also connected Jonah with Solid Ground Board member John Babauta at HomeStreet Bank, enabling him to open a bank account again after several years without one. “They’ve provided me the support I needed to protect me from me – like no over-drafting allowed. I can’t dip into my savings; I literally have to go over to the branch and have a reason to go into my savings account, which is really great. Now I have a solid foundation of where to keep and how to protect my money. Visit Solid Ground’s Financial Fitness Boot Camp webpage for more info on the program. This post was contributed by Kira Zylstra, Solid Ground’s Stabilization Services Director. Throughout the month of April, Solid Ground participated in the Corporation for Enterprise Development’s Financial Capability Month. When Solid Ground’s April 7 blog post, Community Conversations, challenged me to #thinkpoverty and #talkpoverty in order to #endpoverty, I took this as a challenge to #thinkopportunity and #talkequity as well. Today, April 30, marks the last day of National Financial Capability Month. In order to work towards achieving equity and opportunity for all, Solid Ground has set the goal of adopting the principles of financial empowerment across all of our programs and services. We recognize that Financial Literacy and Asset Building are critical components to our mission of ending poverty. The Financial Fitness Boot Camp team hosted creative discussions with staff to recognize and celebrate the many ways we all incorporate financial literacy into our work. Held several community workshops focused on nutrition and tenant’s rights which all included education on the importance of budgets and money management. Solid Ground has had the opportunity to work closely with the Corporation for Enterprise Development (CFED), which has been sharing weekly updates, resources, and tools on Financial Empowerment to celebrate Financial Capability Month. Check out their latest here: Integrating Financial Capability. We want to hear from you! Where do you see #FinancialEmpowerment in action in our community? Comment below or via Solid Ground’s Facebook and Twitter feeds!